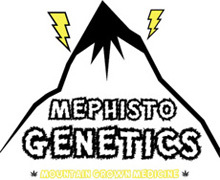 Mephisto Automatic Genetics is a real superb breeder of finest automatic strains in feminized form. This enterprise based in beautiful Spain is producing only female automatic cannabisseeds for outdoors and indoors, for expert growers and for the novice gardener as well. The varieties are not generic auto crossed with auto strains, they are fully worked from non-auto to auto over many generations. Chem City Blues, Ripley's OG, Auto Blues, Deep Blue C or the Tyrone Special are all automatic cannabisseeds in its own league, absolutely fantastic stuff. Mephisto believes that all their autoflowering varieties and all the projects are in a class of it's own, you are invited to try the products to see how good automatic cannabis can be.